Keizai Waza requires a lot of finesse to play effectively. They have the single most difficult weapon in the game to pull off - the TAC Nuke. It is very tricky, but extremely satisfying when successful. 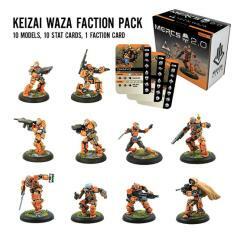 This Japanese faction's attacks require precision, positioning, and a strong understanding of how to manipulate the MERCS initiative system to be effective.